Upon landing at Bandaranaike International Airport in Colombo, you will be met by a tour representative and escorted to Habarana. Check in at the hotel, and enjoy the rest of the day to relax. Visit the sacred city of Anuradhapura, followed by a visit to Mihintale in the afternoon. Once you are done, return back to hotel for overnight stay. Have a delicious breakfast from the Hotel and then head to the famous Sigriya rock Fortress for some sightseeing and climbing. After this, visit the medieval capital of Polonnaruwa. On the 4ath day leave for Kandy after breakfast. On the way stop by Dambulla Rock Cave Temple; explore a spice garden and a batik factory and then reach Kandy to check in for the night. In the evening, enjoy a performance of Kandyan dance, and visit the Dalada Maligawa (Temple of the Tooth). On the fifth day you can finally go souvenir shopping for your loved ones back at home. The city of Kandy offers the best of products at discounted prices. Once you are satiated with your purchases you can visit the Royal Botanical Garden before continuing to Nuwara Eliya, stopping at a tea factory en route. Later in the evening you may visit the golf course, Victoria Park, and Gregory Lake. This day is reserved for the majestic Rawana Waterfalls in Katargama. Check in at a hotel there and then leave for a safari in a jeep to Yala National Park. Overnight stay at the Hotel. Post breakfast we will head back to Colombo through the cities Hambantota and Meligama where you can witness the salterns and the stilt fishermen respectively. Bring an end to your Sri Lanka tour by exploring Colombo. After breakfast, depart for Bandaranaike International Airport in time to catch your flight. Sri Lanka is loaded with sentimental scenes, administered by rising mountains, rich woods, sea like tanks and spouting waterfalls, that it was viewed as the lost heaven by numerous a globe trotters, who fell upon the nation. The brilliant shorelines of the nation had been applauded for their photo postcard views since forever. The nightfall and day break and numerous human exercises associated with these seasons of the day makes an energetic picture along the banks of Sri Lanka. One must embark on a tour to Sri Lanka to experience such beauty that cannot be captured. The focal good countries of the island are loaded with pictures of mixing mountains covered with rich green tea gardens, thundering waterfalls blending with the mists and scenes shining in daylight and vanishing under the rising fog. Huge statues of Lord Buddha transcends the backwoods line while old castles stand deserted to the woods, sitting tight for an ace, who since quite a while ago withdrew from life. Travel Sri Lanka to be encompasses in mystery and contentment. 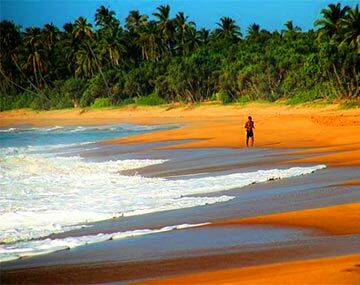 Choose from the numerous Sri Lanka tour packages and set off to witness heaven on earth on this island. BookOtrip.in reserves the right to change / modify or terminate the offer anytime without any prior notice.